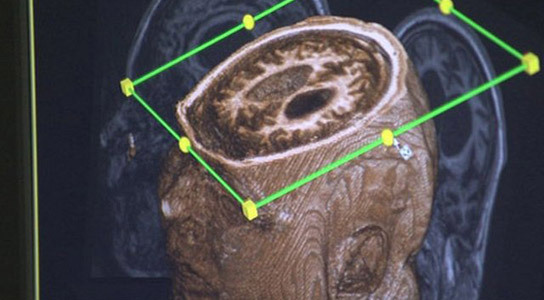 fMRI scan of vegetative state patient. A Canadian man who was thought to have been in a persistent vegetative state for more than a decade has been able to communicate to scientists that he isn’t in any pain. This marks the first time that an uncommunicative, severely brain-injured patient has been able to give clinically-relevant answers to physicians. Scott Routley, 39, was asked questions while having his brain activity scanned in a functional magnetic resonance imaging (fMRI) machine. Vegetative patients emerge from a coma into a condition where they have lucid periods, but have no perception of themselves or the outside world. Routley suffered a severe brain injury in a car accident, 12 years ago and none of his physical assessments since then have shown any sign of awareness. Adrian Owen, a neuroscientist at the Brain and Mind Institute, University of Western Ontario, believed that Routley was clearly not vegetative. Another Canadian patient, Steven Graham, was able to show that he had laid down new memories since his brain injury. Graham answered yes when asked whether his sister had a daughter. His niece was born after his accident, five years ago. 1 Comment on "Canadian Man in Vegetative State Communicates That He’s Not in Pain"
I guess the term, “quality of life” differs from person to person.What machines are keeping these men alive?